One of the most challenging things for an ambulance administrator or the person who works with accounts receivables is nonpayment for services rendered. In tight fiscal times the aging report or daily sales outstanding number are important measures to an organization's collections and cash flow management. The Professional Ambulance Association of Wisconsin is pleased to offer its members an agreement with Transworld Systems Inc. that provides a credible solution that goes directly to the bottom line and avoids or reduces patient billing and collection nightmares. 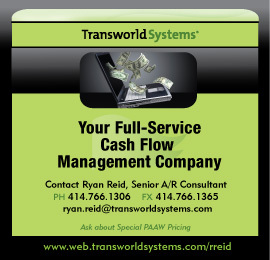 Transworld Systems is an industry leader in delinquency and cash flow management by providing fixed fee accounts receivable solutions & collections, averaging less then $10 per account. Transworld Systems serves many medical clients allowing them to focus on their patients while we help them manage their cash flow. Transworld Systems, provider of GreenFlag Accelerator, GreenFlag Profit Recovery/Collections and GreenFlag Insurance Resolution, with the highest documented recovery rate in the industry, has been serving the accounts receivable needs for businesses nationwide since 1970. They assist business owners and medical professionals with better tools for increasing cash flow, accelerating payments, recovering bad debt and recovering past due accounts. They have assisted over 200,000 clients during the past ten years recovering over $6 billion-dollars in receivables. "For more than 12 years we have used Transworld Systems to successfully collect on our slow paying accounts, and would recommend them to any ambulance service looking to increase their cash flow." "Transworld Systems as a whole has also proven to be professional with their verbal and printed communication to our clients and our company. In the two years since we began using Transworld we have not received any legitimate complaints from customers about the Transworld staff. Transworld Systems has helped steam line our collection process and increase revenues received from our accounts that go to collections." To read a letter of recommendation from PAAW member and President at LifeStar EMS, Michael Krueger, click here. Product testimonials posted at YouTube.